As sweet as cinnamon: Where does time go? & Tagged! 2. On the subject of names my husband gave me a middle name as a wedding present. I am ok if I am a safe distance from them. 4. I failed home economics (sewing in particular) at school. 5. I like to sleep with a quilt on even in the summer. 6. I like to read the Websters dictionary at times because I find it interesting and good for my brain to learn a new definition. 7. I still have my pillow from when I was a child.... and can't sleep without it. It does get washed often ( in hot water) and refilled with foam bits as it gets squashed...it also has had a new outer cover a few times ( about 10) but still feels the same.....or at least it does as I remember. 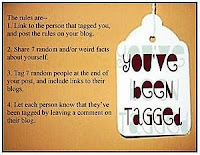 I now have to tag some people........maybe if you want to participate in this please leave a comment and they can visit your blog and find out a little bit more about you! Hi Dawn, love to learn new things about you. I'm petrified of water too! And, I love how your parents picked your name - so practical but sweet. I enjoyed reading your answers. It was a nice time of the day to be born. I loved reading your 7 random things. Isn't it nice to discover little pieces of 'trivia' that make us into the people we are. Thanks for sharing with us. Lovely smocking.I do adore the look of it. I find your smocking also lovely!